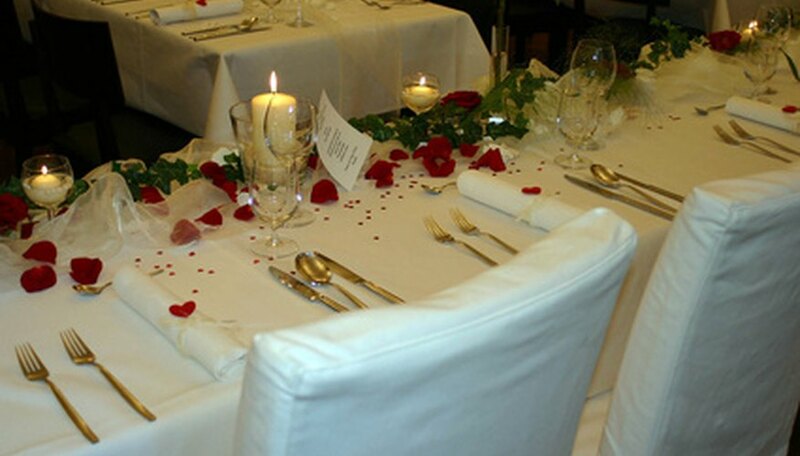 Chair covers are the perfect final touch to make your dinner party or reception a first-class event. A pillowcase chair cover is a fabric overlay that goes over the top of chair. Chair covers can tie in a room's color scheme and make boring banquet chairs look like elegant pieces of furniture. Unlike other chair covers, pillowcase covers come with the sash built in rather than as a separate piece of fabric. Both types of chair covers are tied similarly. Iron the pillowcase chair cover and make sure that it is clean and free of wrinkles. Wrinkles may keep the chair cover from sitting squarely on the chair. Place the chair cover over the top of the chair. Place the cover so the hem of the chair cover is even on both sides. Check the ties on the back of the chair. They should be the same length when pulled straight back from the chair. If they are uneven, shift the chair cover until the ties are the same length. Hold a sash in each hand. Find the center of the back of the chair. Tie a knot with the two sashes so that the knot is placed squarely in the middle of the back of the chair. Smooth out the remainder of the sash. You can leave the pillowcase chair cover like this or add a bow. Make a loop with both ends of the sash. Tuck one loop under the other, much like you would tie a tennis show lace. Leave the bow loose. Straighten out the fabric so that it will lay flat against the back of the chair when pulled tight. Fluff the bow width-wise. Pull both sides of the bow tightly and fluff with your hands. Straighten the tails of the bow. Chair covers are often made from delicate fabrics. If you rented your chair covers, do not wash them before returning. Untie the chair covers and shake them out to remove any food pieces before placing them in the box they will go back in.